At Discovery Institute of New Jersey’s rehab for adults, we take the time to develop treatment plans individually for all of our clients. Many rehabs are geared only towards young adults, but we take pride in catering to a mature adult population as well. Different segments of the population have specific needs based upon their stage in life, and we work to tailor our program to address these needs. Our program is separated based on age, so that clients can recover together among their peer group in a supportive, understanding atmosphere where they can relate to other clients. The adult program at the Discovery Institute of New Jersey is geared towards adults over the age of 30, may be dealing with different life circumstances and issues than a younger population of clients. At the Discovery Institute, we understand the importance of addressing every facet of our clients’ lives in order to provide effective treatment and a foundation for long-term sobriety once our clients graduate from treatment. Our case managers are experienced in preparing court documents verifying patients’ enrollment in treatment, as well as providing detailed and accurate progress reports to the correct administrative bodies for clients who require documentation. 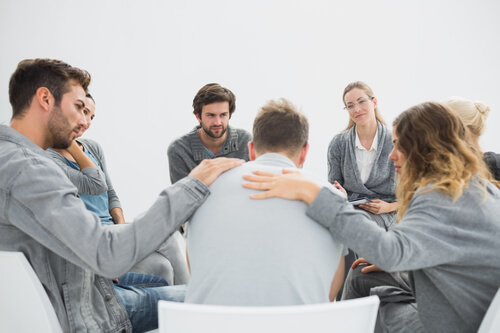 Our therapists are experienced in counseling patients who are facing legal repercussions for their actions prior to enrolling in drug and alcohol treatment. At Discovery Institute, we have a family counseling program that addresses strained interpersonal relationships between clients and their loved ones. Clients who are in marriages and wish to work on those relationships will have an opportunity to work on communication, processing and expression of emotion, and boundary-setting with their spouse, under the guidance and direction of one of our licensed family counselors. Oftentimes, addiction and alcoholism can damage relationships with our families and children. Four our clients who struggle with family relationships, including those with any children they may have, Discovery Institute provides a family counseling program designed to work through these issues in a healthy and productive way. Repairing these relationships assists our clients in their long-term recovery, and we are committed to helping our patients work toward that goal while they are in treatment with us. Unemployment is often an unfortunate consequence of active addiction. At Discovery, we work with our adult population to help them identify specific job skills and goals, and to implement them in their daily lives. We focus on teaching skills like time management and coping with stress, so that our clients can find and maintain successful careers once they leave treatment. According to the Journal of American Medical Association, 37% of alcoholics and 53% of drug addicts suffer from a co-occurring mental illness. These dual diagnosis patients often suffer from symptoms outside of their addiction, and without proper treatment, are at a greater risk of relapse once they leave treatment. At Discovery, we have doctors and therapists on-staff who are experienced in treating co-occurring mental disorders such as depression, bipolar disorder, and anxiety. We work with our clients to get them on the correct treatment regimens to address their addiction as well as their dual diagnosis. When a patient is in active addiction, they tend to neglect their physical health. When these patients come to Discovery, our staff conducts a full assessment so that our doctors can identify and address any underlying medical issues that our patients may be suffering from. We strive to treat the whole patient- body, mind, and spirit. This includes proper medical treatment for any physical ailments they may be suffering from. Our on-staff nutritionist works with our clients to create a healthy meal plan that will aid in clients’ physical health and recovery. Proper nutrition is part of holistic health, and at Discovery we pride ourselves on helping clients to achieve well-being in every aspect of their lives. Entering treatment can be stressful, because clients are often concerned about their lives outside of treatment and their long-term goals. We work with clients to help them stay focused on healing in the present moment, but our staff also helps clients to address their long-term goals and concerns through therapy, group processing, and case management services. Our well-rounded approach ensures our clients’ best shot at long term sobriety. We want to approach sobriety as completely and thoroughly as possible, and that must include addressing all life factors that play a role in long-term health and recovery. We aim to leave no stone unturned, and to provide our clients with the tools they need to handle any situation they come across in their lives once they have graduated from treatment. When a client enters Discovery Institute of New Jersey’s drug and alcohol treatment program for adults, a thorough assessment is done to rule out underlying medical conditions as well as emotional and traumatic factors that may have contributed to their addiction. This allows our staff to create a comprehensive, individualized treatment plan that addresses all of our clients’ unique and personal needs. We know how important it is for adults who are established in their lives to get back on their feet with regards to employment and family relationships, and we tailor our adult programs to assist them in that goal. Treatment at the Discovery Institute of New Jersey is holistic in nature, meaning that we aim to treat every aspect of a client’s health. For this reason, we offer specialized treatment and group processing opportunities for adults over the age of 30, along with our standard treatment program. In addition to helping our clients process their emotions and experiences, we work with them to solve legal, interpersonal, and employment issues. Treatment for addiction at Discovery Institute is the first step towards achieving a happy and fulfilled life free from drugs and alcohol.